Like change, adversity is a constant in life. One principle I learned from LIFE founders Orrin Woodward and George Guzzardo early on is how to respond properly to adversity. Adversity can sometimes be categorized as bad luck (even though I don’t believe in luck), misfortune or hard knocks. We have pain attached to losing people we love, relationships, money, illness, depression, general feelings of unfulfillment and unexpected catastrophe. For example: About two weeks ago I hit a deer with my car late at night and totaled it. If that happened 4-5 years ago my response would have been much different than it was two weeks ago. While it was frightening in the moment, there was little to no stress associated with the situation. Adversity is not something we ever want but it is always something we should expect as humans. Knowing that adversity is a constant in life, we should talk about how to respond properly so as to not fall into the ‘woes me syndrome’ and throw ourselves a pity party and invite all the negative Nancy’s to join us. A parable is told of a farmer who owned an old mule. 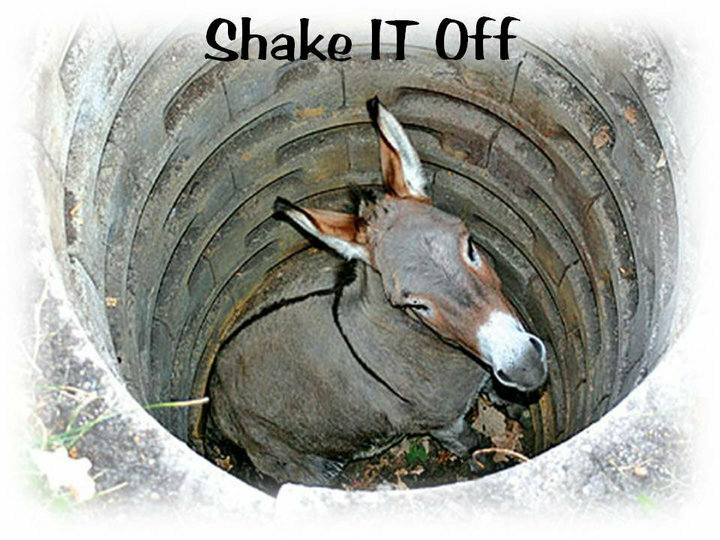 The mule fell into the farmer’s well. The farmer heard the mule ‘braying’ -or-whatever mules do when they fall into wells. After carefully assessing the situation, the farmer sympathized with the mule, but decided that neither the mule nor the well was worth the trouble of saving. Instead, he called his neighbors together and told them what had happened …and enlisted them to help haul dirt to bury the old mule in the well and put him out of his misery. Initially, the old mule was hysterical! But as the farmer and his neighbors continued shoveling and the dirt hit his back … a thought struck him. It suddenly dawned on him that every time a shovel load of dirt landed on his back, he should shake it off and step up! This he did, blow after blow. “Shake it off and step up…shake it off and step up…shake it off and step up!” He repeated to encourage himself. No matter how painful the blows, or how distressing the situation seemed the old mule fought “panic” and just kept right on shaking it off and stepping up! It wasn’t long before the old mule, battered and exhausted, stepped triumphantly over the wall of that well! What seemed like it would bury him, actually blessed him…all because of the manner in which he handled his adversity. If we face our problems, respond to them positively, and refuse to give in to panic, bitterness or self-pity. The adversities that come along to ‘bury us’ usually have within them the potential to benefit and bless us. Adversity will happen at the most inconvenient times (or at least that’s how it appears in the moment). But the goal is the learn how to grow in our reactions during those times. Orrin Woodward and George Guzzardo have been solid objects in the face of adversity. While I know their struggles are similar to ours, the way they respond to adversity it much different than ours. However, through continual growth in the-life-business and by growing in our relationship with Christ, we can learn how to respond properly no matter what difficulties we face. Great wordpress blog here… It’s hard to find quality writing like yours these days. I really appreciate people like you! writing, it’s rare to look a great blog like this one nowadays..
friends or meet someone special just because your clothes make you look dirty, sloppy or slutty. Do you notice your chin appearing twice when you see yourself in the mirror. how’s and whys and the way things work and the reasons as well. a while that isn’t the same out of date rehashed material.